Cutting patterns, optical properties, and natural color distribution all contribute in a small way to building a gemstone’s overall appearance. These characteristics provide individual distinction, making every gemstone unique in its own way. While we do our best to cut our gems with precision, it is extremely difficult to make gems of varying sizes and shapes look identical. Subtle variations can lead to noticeable differences among gem sets. That’s why we take the additional step of matching to ensure your stunning piece meets the highest standards. 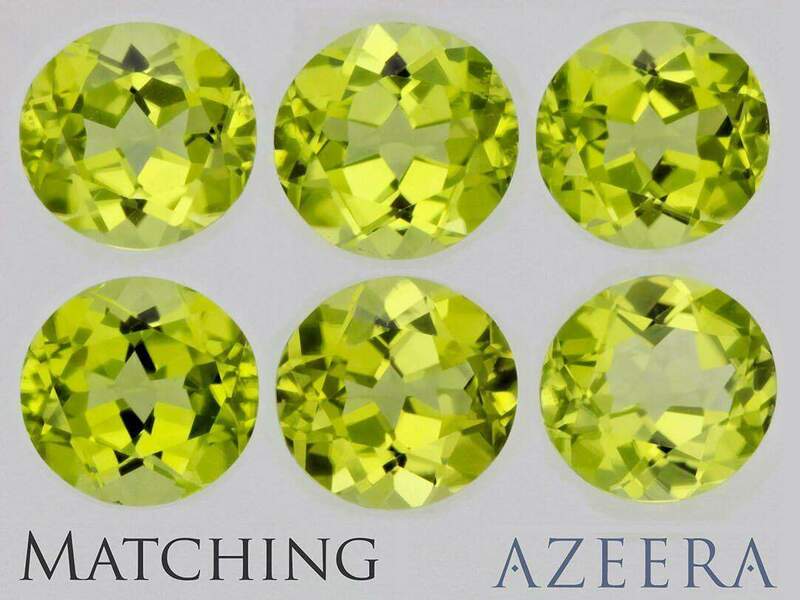 AZEERA’s matching process sorts through large parcels of gems to find stones that are similar in color, clarity, cut and carat to provide only the best to our customers. Proper matching is the mark of extreme attention to detail, further enhancing the value of your investment. shows a well matched set of stones while the bottom row shows a poorly set of matched peridot.